Are you looking to update your Council website? Genuine community engagement and a delightful customer experience are two of the most important expectations communities have of their local council. The council website is the primary contact point through which both of these expectations are met and delivered on. CivicPlus® is a solution that will engage and delight your customers. Local councils are as unique and different as the people they serve. So we've sourced a solution that enables every local government website to be custom designed and personalised. Do you want to empower teams across your council to manage their own pages? Our content management system is easy to use with approval workflows that can be set up to make publishing a breeze. CivicPlus® invest over $1 million annually on cybersecurity. The benefits of that investment include the ability to offer 99.9% up-time on an industry leading data centre with proven redundancy built in. So you're looking to build a new website? That's both exciting and daunting. Don't worry, we're here to help. And we specialise in building websites specifically for local government. A member of our team will be in touch by phone to find out more about your project and answer any questions you may have. If you'd like us to contact you, complete the form and please include a brief description of what you're hoping to achieve from your website redesign process. According to the Australian Bureau of Statistics, over 4 million people in the Australia are living with a disability. The first step to ensuring compliance is to evaluate your website using the Web Content Accessibility Guidelines (WCAG), an international standard that is backed by the World Wide Web Consortium (W3C) and the Web Accessibility Initiative (WAI). 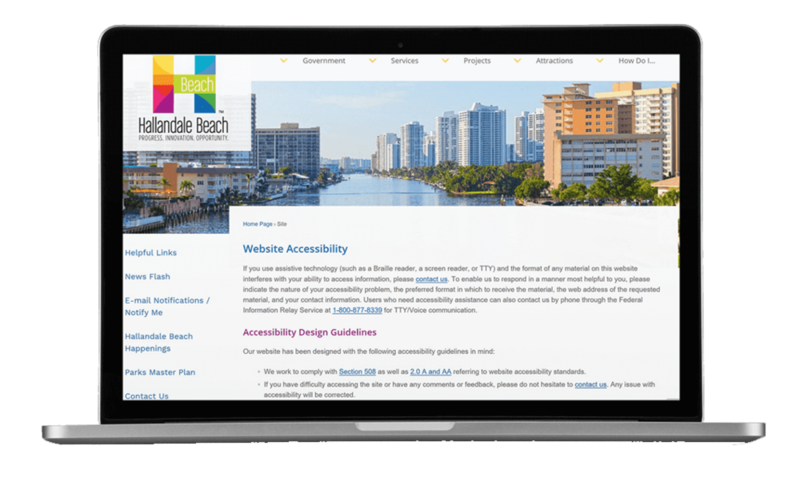 Download our Website Accessibility Checklist to find out how your current site rates.